Dambuster pays tribute to legendary wartime pilot Guy Penrose Gibson, who was awarded the Victoria Cross after leading 617 Squadron on their daring low-level raid on the Ruhr dams in Germany on the night of 16/17 May 1943. As well as a rare radio interview with Gibson recorded in America that same year, the CD also includes a 1944 interview with members of the Lancaster crew led by Harold 'Mick' Martin, who also took part in the famous raid. The 75 minute CD also includes a re-creation of a radio programme Gibson recorded in February 1944, for which he selected eight favourite pieces of music, including Wagner, Strauss, Bing Crosby and Addinsell's wartime evergreen Warsaw Concerto. Gibson's words are voiced by the actor Richard Todd, who played Gibson in the famous 1955 film The Dambusters, and a veteran of D-Day himself. 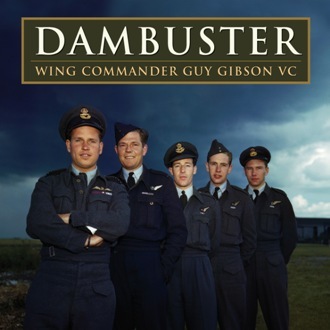 The CD also includes the evergreen Dambusters March, written for the film by composer Eric Coates, and closes with Todd's recollections of the making of the film, and playing Gibson. In February 1944 Wing Commander Guy Gibson, VC, selected eight of his favourite gramophone records for broadcast on the Home Service. Still only 25 years of age, Gibson was then the most highly decorated man in the British Empire, having led the daring low-level raid by Lancaster bombers of 617 Squadron on the Ruhr dams in Germany on the night of 16 May 1943 (Operation Chastise). At the time he chose his castaway selection, Gibson had returned from a lecture tour in America and was engaged in writing Enemy Coast Ahead, a revealing account of his career as a pilot in wartime. Having already completed 174 combat missions, Gibson insisted on returning to operational flying, and on 19 September 1944 was killed when his Pathfinder Mosquito crashed in Holland. Seven months earlier, in February 1994, Gibson selected eight of his favourite records for broadcast on the Home Service. Although the original recording has since been lost a transcript survives, and on this CD Gibson's words are voiced by Richard Todd. The music tracks are the original versions broadcast in 1944. Guy Gibson: Well, I'm not a highbrow by any means. I fact I can't claim to know an awful lot about music at all. Somehow I never seem to have had time to do anything about it, except to listen occasionally to something that I liked the sound of. When I came to think this island problem over I didn't have much difficulty in deciding which eight records I wanted - but I did have difficulty in finding out what the titles were. Mostly I hummed bits of them over the phone to musical friends. My wife helped quite a lot. The first choice is an easy one - the Warsaw Concerto. Firstly, in my opinion this piece of music somehow seems to illustrate the mind of every airman. Not only that. It has a very strong sentimental appeal for me. In the days when my squadron was bombing Germany every night this was the record that, at our many parties in the Mess, we would put on the radio-gram and let it repeat itself again and again. This went on for a long time, and a good many parties, until there were very few left in the Mess who remembered those who had listened to it first in the days gone by. London Symphony Orchestra conducted by Louis Kentner (Columbia DX1062), from the soundtrack of the film Dangerous Moonlight (1941), also later known as Suicide Squadron. My second choice is another one for sentimental reasons. It reminds me of the time when my wife and I were first engaged. I don't say it's a great bit of music, but it's a cracking good dance tune, and it would bring back a lot of very happy memories. It's a tune called Where Or When. Dates back to 1940. In the summer as far as I was concerned. Geraldo and the Savoy Hotel Orchestra, with vocal by Michael Eastley, recorded January 1940. Third one is a Strauss waltz. I've always loved them. They've got a sparkle and a lilt and a sort of everlasting quality. This was one case where I was stuck for the title. I knew the waltz I wanted all right, but I didn't know the name of it. But by humming it in people's faces I found out it was called One Thousand And One Nights. Now another orchestral piece. The Overture to The Flying Dutchman. I don't think I can dig up any sort of reason. I've always liked it, ever since I was a kid. I don't believe I should ever get tired of it. It's grand. It's probably because it reminds me of the sea, and I love the sea. Now for a complete change - a tune that's very popular at the moment, although I believe actually it is quite an old one. Perhaps, as tunes go, it's a wee bit corny - but then I rather like corny tunes and I'm very attached to this one - If I Had My Way, sung by Bing Crosby. I've heard so many imitation Crosbys giving out over the intercom when we're flying that it would be a treat to have the real thing. My next record would, incidently, be a souvenir of one of the most exciting things that happened in my life. This particular thing was a very pleasant thing. Last August I went over to Canada and toured air stations there, and then I went down to the States and travelled over the whole country, including a fortnight in Hollywood. No, not a film star record, like Betty Grable or Judy Garland. Nothing like that. It's a march, one of the finest marches there is. I heard it first at a march-past in America. It's the American Marines march - To the Shores of Tripoli. Fred Waring and his Pennsylvanians. Brunswick 3346-A. Also known as The Marines Hymn. After that, another march. A very familiar one to me - but every time I hear it, it never fails to send a shiver down my spine. The Royal Air Force March. The Band of HM Royal Air Force, conducted by Wing Commander RP O'Donnell. Columbia DB 189, recorded November 1941. There were quite a lot of contestants for the last place. Wagner won in the end. I want The Ride of the Valkyries. It's exciting, it's grandiose, it's - rather terrible. It reminds me of a bombing raid. Though I don't say it's like one. Guy Gibson radio interview recorded in Canada in late 1943. Here Gibson talks about the Battle of the Barges in 1940, his experience as a night fighter pilot with 29 Squadron flying Beaufighters, Anglo-American cooperation, his attitude toward facing death, and the defeat of Germany. Gibson hints that 617 Squadron fully expected to take heavy losses on the Dams raid. Please note that due to the age of this recording it contains some imperfections. Three members of the crew of Lancaster AJ-P 'Popsie' of 617 Squadron interviewed by Roy Lee on 31 May 1944. All were Royal Australian Air Force (RAAF) personnel. Pilot Squadron Leader Harold 'Mick' Martin (DSO and Bar, DFC and Bar) pays tribute to his previous front gunner, Flight Sergeant Harry Smith, now missing in action; rear gunner Flying Officer Thomas Simpson (DFC, DFM) describes the attack on the Mohne dam on the night of 16/17 May 1943; front gunner Flying Officer Bertie Foxlee (DFC, DFM) also describes the breaching of the Mohne dam, and a subsequent mission to the south of France. AJ-P Popsie was the third aircraft to attack the Mohne dam, bombing from just 60 feet, although its Upkeep bomb overshot the target. Richard Todd talks about the filming of The Dam Busters (1955) and The Longest Day (1962), and portraying Guy Gibson on film. Recorded in April 2009. Born in Dublin in 1919, actor Richard Todd was a founder of the Dundee Repertory Theatre, and on the outbreak of war in 1939 volunteered for army service. After being commissioned into the King's Own Yorkshire Light Infantry, Todd joined the 6th Airborne Division, and on 6 June 1944 was part of the glider and parachute force which held the Orne canal bridges between the beach head and Caen. Following the Normandy campaign Lieutenant Todd took part in the Rhine crossing, and after a final posting to Palestine was demobbed in 1946. His subsequent film career included several service roles in documentary-style films, including The Dam Busters (1955), The Yangtse Incident (1957) and The Longest Day (1962), in which Todd played Major John Howard and reprised events at Pegasus Bridge on D-Day. One of the leading British movie stars of the 1950s, Todd was also Ian Fleming's first choice to play James Bond on screen. At the end of the Sixties Todd returned to theatre work, and in 1986 published a memoir of his wartime service, Caught In The Act. He died in 2009.